Cataclysm ROM for Nexus 5! ~ AndroidRootz.com | Source for Android Rooting, ROMS, Tricks and More! Cataclysm ROM for Nexus 5! 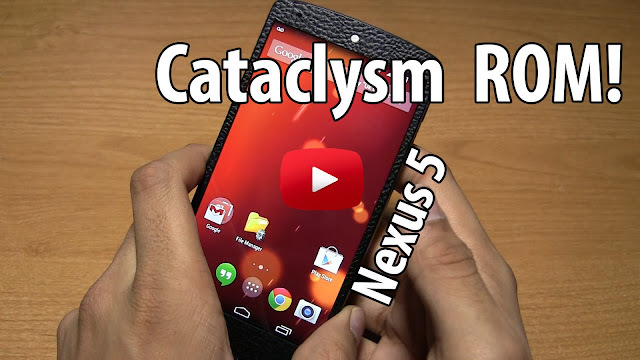 Cataclysm ROM for the Nexus 5 is one of the most highly demanded ROMS for the Nexus lineup. Cataclysm not only brings in new and exclusive features to their ROM they are also one of the first to release a custom ROM for the Nexus 5! One of my favorite features with this ROM is "Immersive mode" allowing you to put your phone into full screen by removing the status bar and navigation keys and only show up when you swipe from the top or bottom of the screen. This ROM also includes a bunch of mods and features to help improve the Android KitKat software experience and even has the option to save a bunch of battery on a daily basis! Download Cataclysm ROM for Nexus 5 using the links below!